It’s that moment of the wedding when ‘they’ are going to arrive and you better get ready when they do! No, we aren’t talking about a superhero’s entry from the Marvel comics, but about your wedding guests. They will fly from every nook and corner of the country to attend your big day. Hold your breath and get ready to be surprised by them – yes, they come in the form of unknown relatives or cousins who suddenly appear in your life out of nowhere. You will hear horrid things about your life from them; for instance, the last time they saw you, you were wearing diapers and look at you today—getting married and all! So, beware as for one, there will be too many expectations from you and two, you wouldn’t want to hear them say unpleasant things about your wedding day after they leave. Whether you like them or not is completely situational, but you got to be ready and give them a welcome of a lifetime (yes, possibly with that extra genuine smile). After all, it’s you who sent them a personal invitation, right? Here are a few desi ways to impress them and make them say, ‘Waah mazaa agaya’! If the wedding venue happens to be a stone’s throw away from your house, how about escorting the wedding guests to the venue in a true old-school way! 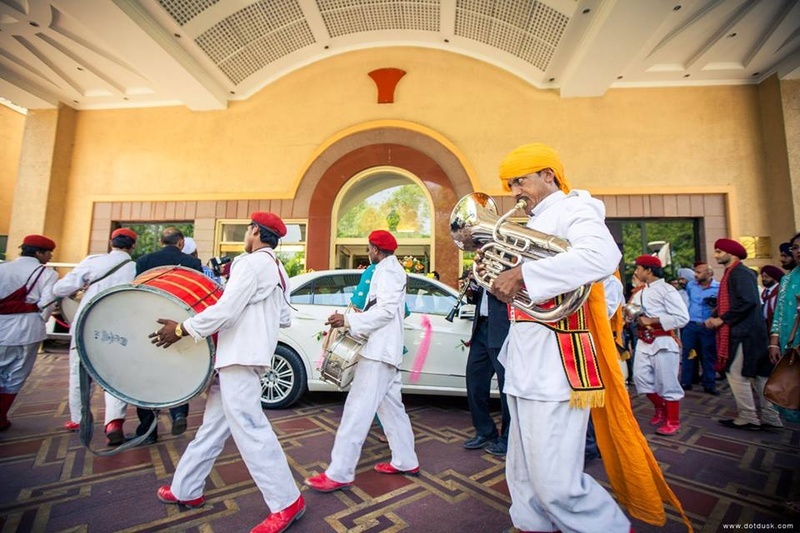 A well-decorated ghoda-gaadi (horse carriage) or a tanga will definitely give them a kick. Have their names written on it, make them feel exclusive and important and they will sing laurels about you, already. As soon as they arrive, have a hostess sprinkle flowers on them. Make them wear a light and comfortable mini-garland and don’t forget a small aarti session. A small tikka on their head will be an added cherry on top and purely desi. Add a sound of dhol-tasha and make their entry musical. You can also make them feel on cloud nine by rolling up a lavish red carpet. Mini-shots of fruity-flavoured drinks with desi ingredients will definitely make them feel rejuvenated. The guests would love indulging in a small packet of mouth freshener or a desi flavoured paan, which will instantly refresh their taste buds. Besides the welcome drink, that mini bottle of Bisleri would also be appreciated as nothing quenches thirst better than water. An Indian wedding usually lasts for 2-3 days, and the guests would love an itinerary of activities, ceremonies or rituals given to them. Gift a personalised scroll to them in a dramatic form and slip in a few salon vouchers. A goodie bag consisting of the above, a few munchies and a small welcome note will absolutely win their hearts. Giving something extra always leaves a fine impression on the guests and tells them that you appreciate their attendance. And the list doesn’t end here. Be it a giant ornamented elephant for sprinkling rose water on your wedding guests, an amazing wedding fireworks display or flower pots, the options are countless. Get into the full-on desi mood and give them an experience they will never forget. Do share your take on funny or creative ways to welcome the guests. We would love to hear from you!